A comprehensive research report on “Algae Oil Market: Global Industry Analysis (2012-2016) and Forecast (2017-2022)” enables the reader to chalk down the strategies in order to progress with the changing pace of the global market scenario. The research report is backed up with a unique research methodology, which presents data and statistics with high accuracy. The global algae oil market research report covers an in-depth market segmentation which covers all angles thus giving a 3600 view of the market delivering necessary value addition with a strategic layout. Secondary research, an extensive primary research along with opinions from key players and sources are the three pillars of this unique value adding research methodology. The secondary research gives an overview of the market scenario on the basis of which a large number of primary interviews are conducted and conversing with the key market leaders just validates the data gathered so far. This data is re-validated as primary interviews progress and each data point gets a realistic shape. With this a data triangulation process is carried out to arrive at single data point with respect to each segment and sub-segment, eliminating the possible and obvious market deviations and errors thereby presenting a thought leader angle to the researched insights. This also enables the reader of the report to correlate the various segmentations and micro segmentations included in the report with the past, current and future market scenario. It becomes important to understand the rhythm of the global market and mere numbers or data or conclusions would not help if not given the right shape. Every region has its own characteristic value which contributes to the global market scenario. An unbiased opinion is what matters and the market research report on algae oil market offers actionable insights which can be used to unmask the trends, develop strategies, and sketch a growth road map. It can be used to make informed decisions. A separate section of the report discusses on the key market players. The competitive dashboard speaks about the strategies adopted by the key companies, their growth patterns, mergers and acquisitions, product portfolios and new innovations coming up, analysis of the technological aspects, their global presence, SWOT and pricing analysis. To know the competition is as vital as analyzing the “to do” things in order to achieve growth stability. The research report gives an exquisite contour of the strengths, weaknesses, the possible threats and opportunities. Algae oil is rich in Omega 3 fatty acids and DHA (docosahexaenoic acid). It is synthesized directly from algae and hence the terminology algae oil. Marine algae is harvested to obtain this product, which is extracted and then refined, ready for use. The DHA present in algae oil accounts for 97 percent of Omega 3 in the human brain, retina and cerebral cortex. It can be called as a rich vegetable source of DHA and Omega 3 which has several health benefits. It is also added in food items, supplements and beverages. Global Algae oil market is influenced by several parameters. The major factors driving the growth of the global algae oil market are its increasing use in the food and beverage industry owing to health benefits associated with the healthy composition of algae oil which involves high phycocyanin, proteins and antioxidants apart from DHA and Omega 3. Algae oil is also used as specialty oil due to its low saturated fat content. Algae oil provides high nutrition and health benefits such as it helps in cholesterol reduction, improves eyesight and memory. Rising health awareness and increasing preference to nutritional vegetable sources is another aspect favoring the growth of the global algae oil market. Algae oil is also used in energy sector, where it is used to produce biofuel. Biofuel is widely used today for its low carbon footprint, and hence consumption of algae oil is increasing considerably in the respect which contributes to the growth of the global algae oil market. However, higher pricing of algae oil is a leg puller which challenges the growth of the global algae oil market. 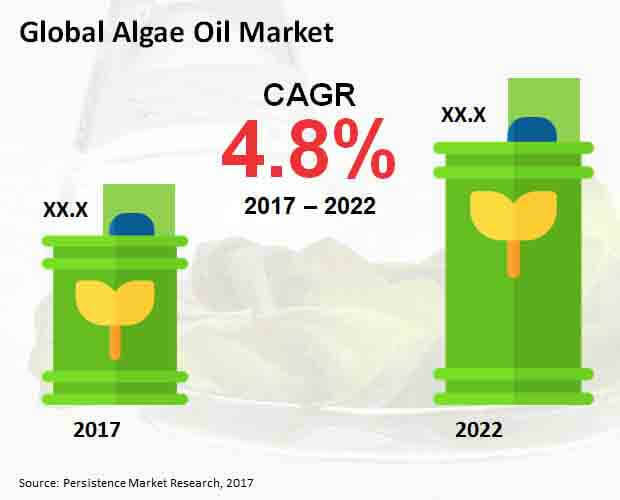 According to Persistence Market Research, the global algae oil market is estimated to reflect a value of around US$1.9 Bn by 2022 end, growing at a moderate CAGR during the forecast period 2017-2022. By grade type, the fuel grade segment is expected to reflect high growth rate during the forecast period 2017-2022. This segment also reflects high market share as of 2017, and according to Persistence Market Research, it is expected to continue with this trend to surpass other segments. It is also estimated to gain a higher BPS by 2022 end. By end user, the pharmaceutical segment is expected to dominate the global market, based on the fact that the segment reflected high market share in 2016, and by the end of 2012, it is expected to continue witness growth with a significant market share. On the other hand, the aquaculture segment is projected to grow at a high CAGR of 5.3% during the period of forecast 2017-2022. This segment shows high potential and presents manufacturers with several growth opportunities in the coming years. By application, the biofuel segment is expected to show high potential and project immense growth rate to reflect a higher CAGR of 5.5% as compared to other segments in the application category. This segment is also expected to dominate the global market in terms of high market share during the forecast period. Following this segment, the pharmaceuticals segment shows significant market value and moderate growth rate during the period of forecast. By sales channel, the direct sales segment is expected to lead the global market and is poised to reflect a high market share by 2022 end. This segment also shows high growth rate to reflect a CAGR of 5.8% during the 2017-2022 period along with a high gain in the BPS. Tough call to make between hypermarket and supermarket segment and specialty stores segment, which have similar growth statistics, however, hyper/super markets segment expected to show high market share. With respect to geography, North America region shows high market attractiveness. This region is expected to grow at a high CAGR during the period of forecast, and reflect a high market share thus dominating the global market by region, followed by Europe. Asia-Pacific excluding Japan (APEJ) region is expected to show a higher growth rate compared to other regions during the forecast period. The research report has profiled companies which are expected to remain active in the expansion of global algae oil market throughout 2022. Companies such as TerraVia Holdings Inc., DIC Corporation, Royal DSM NV, Cyanotech Corporation, Cellana Llc, Cargill Inc., Bioprocess Algae Llc, Diversified Energy Corporation, Seaweed Energy Solutions A/S, Alltech Inc., and Lonza Group AG are profiled in the market research report.